This module is a serial 1:1 communication module for OEM based on Zigbee technology, and is designed so that beginners with Zigbee can easily control a wireless sensor network. 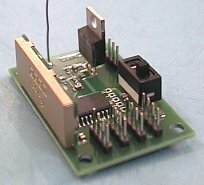 This module has a DIP (Dual In-Line Package) that may be mounted on the user's board and is designed to interface with a TTL UART in the MCU (not RS232). 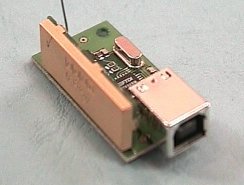 There is an on-board chip antenna and an external antenna (not supplied) can be fitted if required. Operating range is 30m-100m depending on building conditions and antenna. Power can be either 3.3v or 5v. This module is a serial 1:n communication module for OEM based on Zigbee technology, and is designed so that beginners with Zigbee can easily control a wireless sensor network. 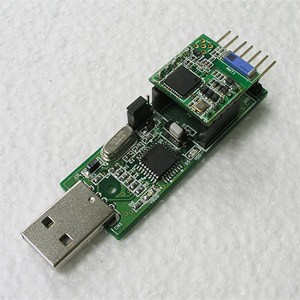 This Zigbee Dongle is for the ZBS100 or ZBS200, and can be used for wireless serial communications by connecting to a notebook or desktop PC. - ZBS100 or ZBS200 may be used (sold separately). 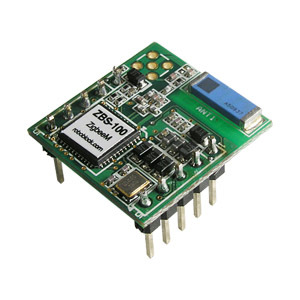 The RF04 is a very easy to use radio telemetry module set for your I 2C devices. The main module is powered from the USB bus, so it needs no external power supply or batteries. Just plug it into your PC and it will appear as a COM port. 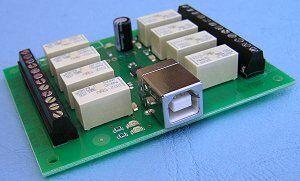 The RF04 module set can be used by anyone who can program a PC to use the COM ports. The CM02 module, together with its companion RF04 module , form a complete interface between your PC and our range of I 2C modules. You can send commands down to your robot and receive telemetry data back up to the PC. Now you have all the modules necessary to control your robot from your PC. The CM02 is powered from your robots battery, which can be anything from 6v to 12v. The CM02 can monitor battery voltage and report this back to the PC (so your robot knows when its hungry!). There are four I 2C connectors on the CM02, but is not limited to four I 2C devices. In practice, you may only need one connector and route the I 2C bus around all the modules you wish. Bit rate on the I 2C bus is approximately 100KHz. Here is RF04 and CM02 datasheet. The RF04-900 uses the LPRS EasyRadio ER900TRS transceiver for EU (868-870MHz) or USA (902-920MHz) markets. Power output up to 10mW. Over Air Data Rate - 19200 bps. The CM02 module, together with its companion RF04 module , form a complete interface between your PC and our range of I 2C modules. You can send commands down to your robot and receive telemetry data back up to the PC. Now you have all the modules necessary to control your robot from your PC. The CM02 is powered from your robots battery, which can be anything from 6v to 12v. The CM02 can monitor battery voltage and report this back to the PC (so your robot knows when its hungry!). There are four I 2C connectors on the CM02, but is not limited to four I 2C devices. In practice, you may only need one connector and route the I 2C bus around all the modules you wish. Bit rate on the I 2C bus is approximately 100KHz. Here is the datasheet . 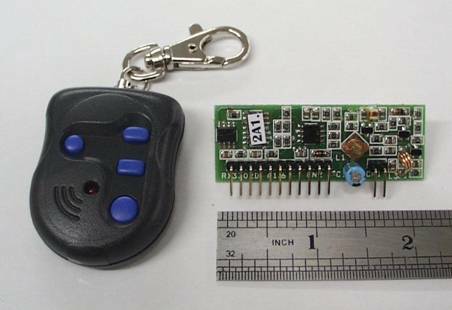 The RF04 is a very easy to use radio telemetry module set for your I 2C devices. The main module is powered from the USB bus, so it needs no external power supply or batteries. Just plug it into your PC and it will appear as a COM port. 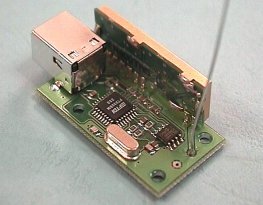 The RF04 module set can be used by anyone who can program a PC to use the COM ports. Here is the datasheet . It can receive up to 64 characters via its serial port and transmit the message. The serial port baudrate is selectable from 300, 1200, 2400 and 9600. The data format is fixed at 8N1 (8 data bits, no parity, 1 stop bit). Two input modes are available as well as input echo if required. An optional destination address can be automatically inserted into the message before transmitting. The RF module operate at 433.92MHz and uses "amplitude modulation" to transmit the data. This is called "On-Off Keying (OOK)" The range is about 100m (300ft). Here is the technical manual. It will receive any messages sent by KIT-RF-SERIAL-TRANSMITTER or KIT-RF-PARALLEL-TRANSMITTER and output the data via its serial port. The data format is fixed at 8N1 (8 data bits, no parity, 1 stop bit). The data rate is selectable between 2400 and 9600 baud. An optional carriage return/line feed can be appended to the output. The RF module operate at 433.92MHz and uses "amplitude modulation" to transmit the data. This is called "On-Off Keying (OOK)" The range is about 100m (300ft). Here is the technical manual. The kit monitors 8 digital inputs for change. If change is detected on any input the state of all the inputs is transmitted. An optional destination address can be added to the message before transmitting. The pinout of the input connector allows direct connection to a PC printer port. The RF module operate at 433.92MHz and uses "amplitude modulation" to transmit the data. This is called "On-Off Keying (OOK)" The range is about 100m (300ft). Here is the technical manual. It will receive any messages sent by KIT-RF-SERIAL-TRANSMITTER or KIT-RF-PARALLEL-TRANSMITTER and output the data via its parallel port. The pinout of the output connector is the same as a PC printer port, allowing direct connection to a printer. Optional features are included to control a Centronics type printer. The RF module operate at 433.92MHz and uses "amplitude modulation" to transmit the data. This is called "On-Off Keying (OOK)" The range is about 100m (300ft). Here is the technical manual. The ideal for adding general purpose I/O lines to the RF04/CM02, or any I2C based application. 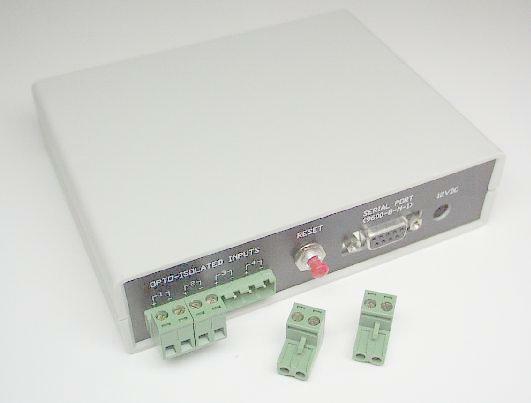 Ideal for adding general purpose I/O lines to the RF04/CM02. Up to 2 SRF04's or 2 SRF05's controlled, including all timing. Up to 14 general purpose Input/Output lines. Up to 5 Analogue input channels with 10-bit A/D conversion. 1 PWM output usable as an 8-bit D/A with a simple filter. I2C address 0x40, can be changed to allow up to 8 devices on the same I2C bus. 6 I/O lines have programmable pull-up resistors built into the chip . Individual control of each pin for Input or Output. Simple commands for Bit Set, Bit Clear and Bit Toggle. Easy I2C bus control, similar protocol as popular EEPROM's such as 24C02. 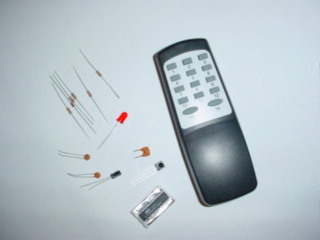 The kit included IR remote controller, decoder IC and all necessary components. 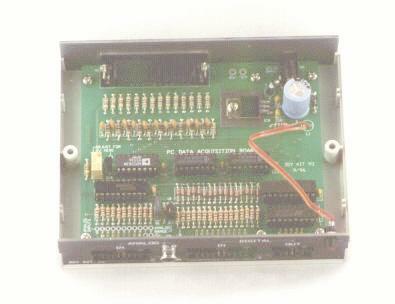 It uses a commercial 14-button remote control unit to put an active low signal on one of 14 pins on a decoder IC. 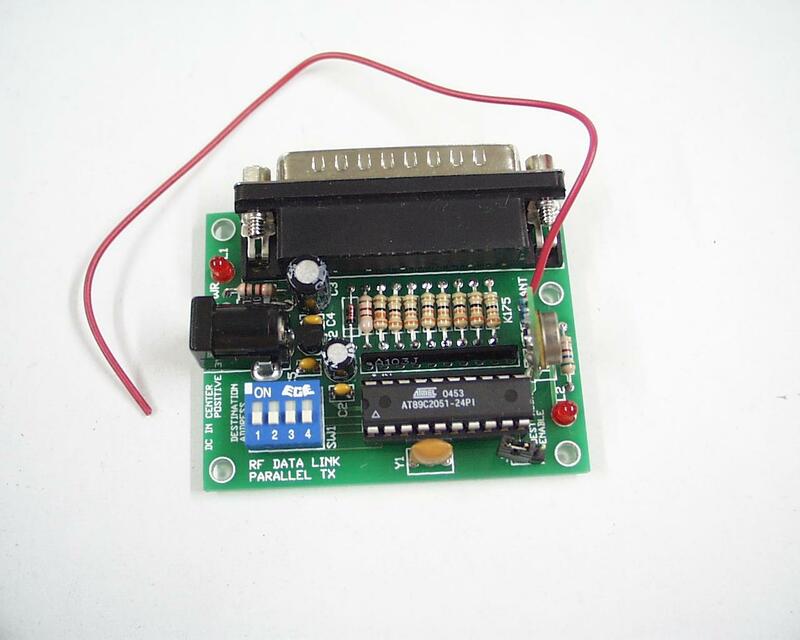 All necessary components and circuit diagram for building a decode circuit with a decoder IC are provided with the kit. 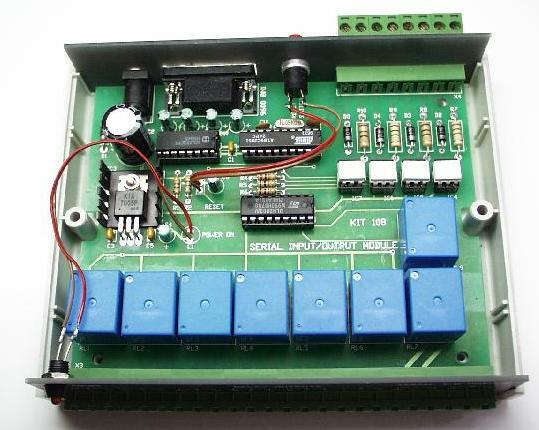 Great to build your own IR remote Robot by interfacing the robot controller with this kit. 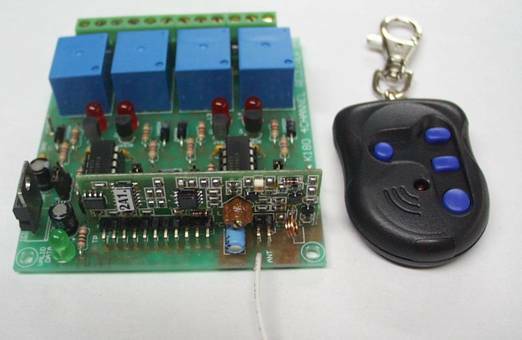 The kit included IR remote controller and 12 relays control board. 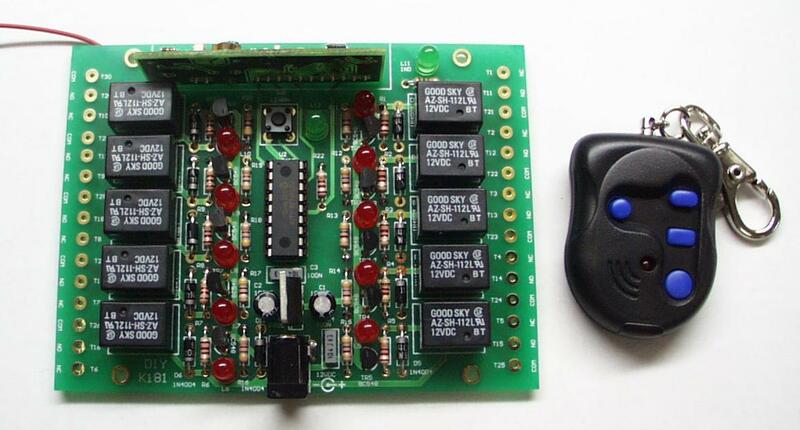 It uses a commercial 14-button remote control unit to put an active low signal on one of 14 pins on a decoder IC. It provides 8 volt free contact relay outputs with a current rating of up to 1 Amp each. It requires a 5v supply and has an exceptionally low maximum current consumption of approx. 100mA with all relays on. The relays are SPCO (Single Pole Change Over) types. The normally open, normally closed and common pins are all available on the screw terminals. Here are the technical specifictions and dimension. The RF transmitter and receiver comes ready-made in a case with a 12V battery. The frequency used is 434MHz. It has a and receiver range of 40-50 meters. 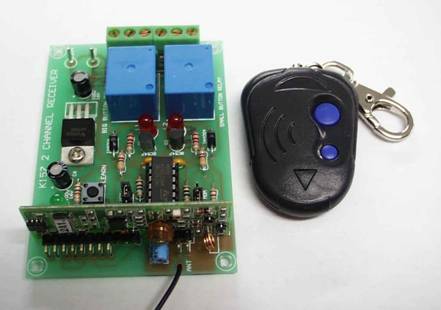 The kit includes two-button transmitter module, a RF receiver module, all necessary documents. The RF transmitter and receiver comes ready-made in a case with a battery. The frequency used is 434MHz. It has a and receiver range of 40-50 meters. 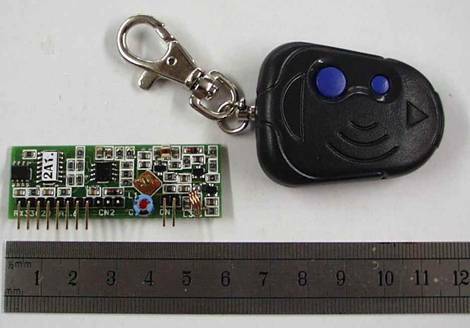 The kit includes four-button transmitter module, a RF receiver module, all necessary documents. 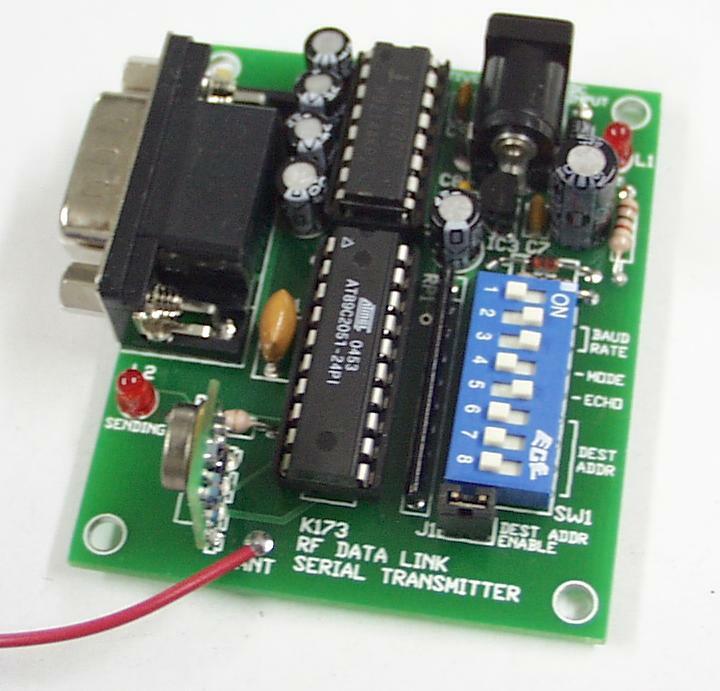 Using the above 2-button RF Transmitter to toggle 2 relays on/off on a RF Receiver PCB. It can transmit up to 50 meters away. 434MHz transmission. 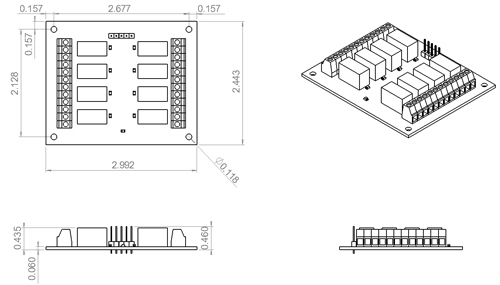 The kit includes full schematic with all components. Assembly instruction included. Great for RF remote control applications. 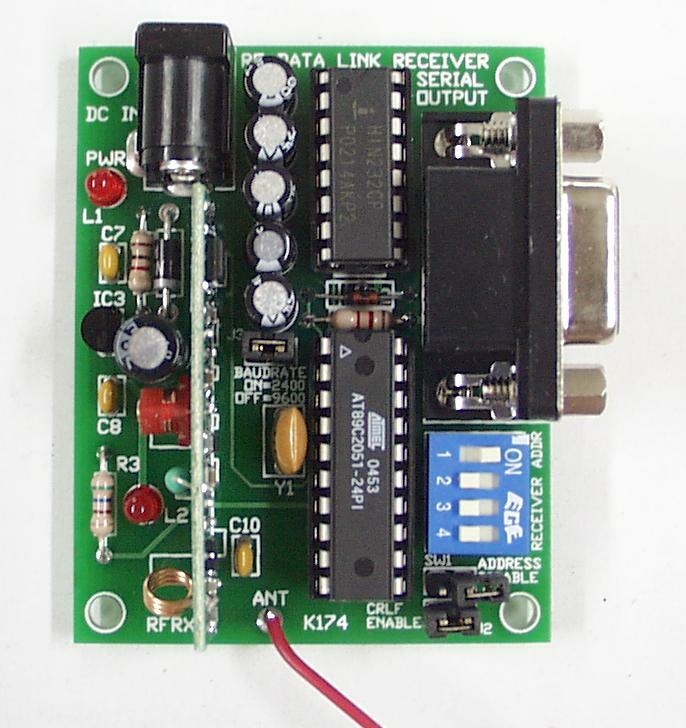 Using the above 4-button RF Transmitter to toggle 4 relays on/off on a RF Receiver PCB. It can transmit up to 50 meters away. 434MHz transmission. The kit includes full schematic with all components. Assembly instruction included. Great for RF remote control applications. 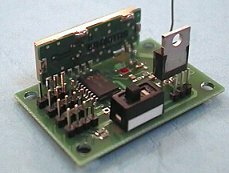 Using the above 4-button RF Transmitter to toggle 10 relays on/off on a RF Receiver PCB. It can transmit up to 50 meters away. 434MHz transmission. The kit includes full schematic with all components. Assembly instruction included. Great for RF remote control applications. 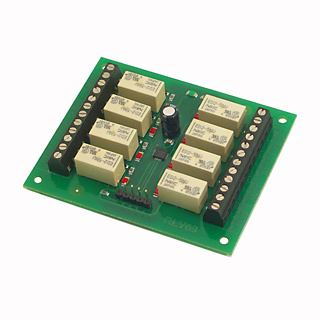 This is a very compact module which allows virtually any PC to be used for quick and easy data acquisition and control. It connects to any standard parallel printer port, and despite its tiny size provides eight analog inputs, four digital inputs and foure digital outputs -- all controlled from the PC using the provided software. PC software and datasheet are included. With the parallel RF data link, you can build a wireleass data logger with 100m range. 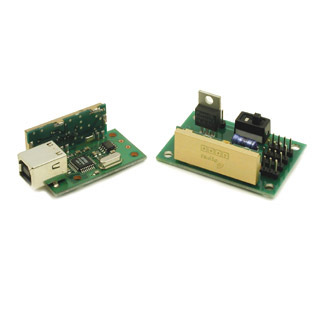 Designed for control and sensing applications, this kit provides 8-relay outputs and 4 optically isolated inputs. It can be used in various applications inclusing load switching, external switch input sensing, contact closure and external voltage sensing. It is controlled via PC serial port using a set of simple text commands. After programming the PC can be disconnected from the PC without affecting the state of the relays. 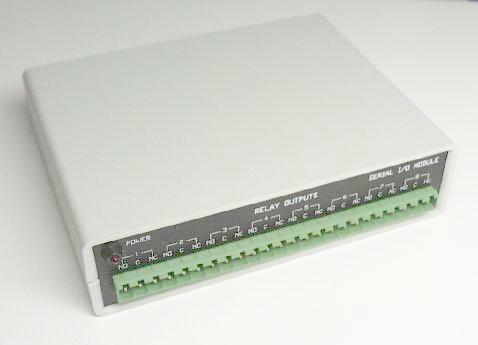 It requires an external controller such as a PC to send it defined commands to control the relays and monitor the inputs. PC software and datasheet are included. With the serial RF data link, you can build a wireleass data controller with 100m range. Do you have an old PC lying around the house which absolutely no one wants? Then you can convert it into a dedicated controller. Communicate with the real world via the parallel printer port on your PC. Simply connect printer cable from computer to Centronics connector on relay board. 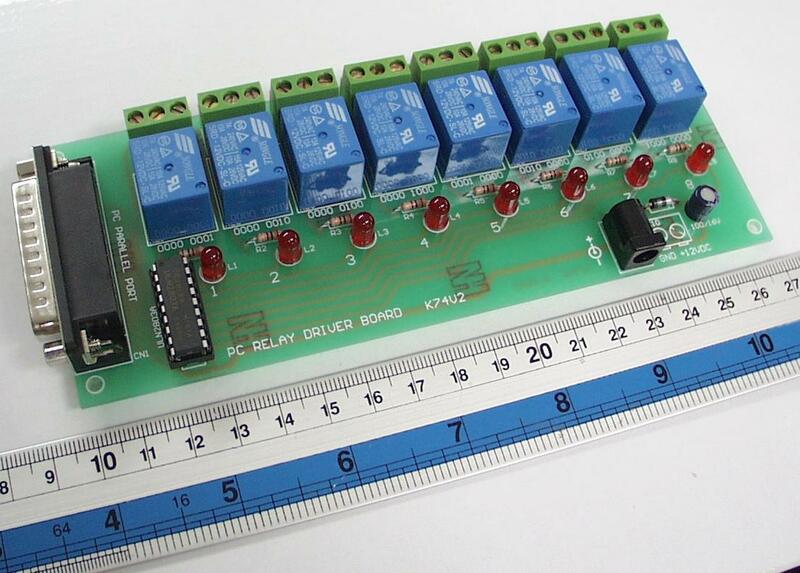 There are 8 relays each capable of switching 12VDC/10A or 240VAC/5A. Each relay has an LED to indicate when it is operated. We provide two sets of complete, stand-alone software to control the relays: one works under DOS so you can write your own batch files to control individual relays. PC software and datasheet are included. 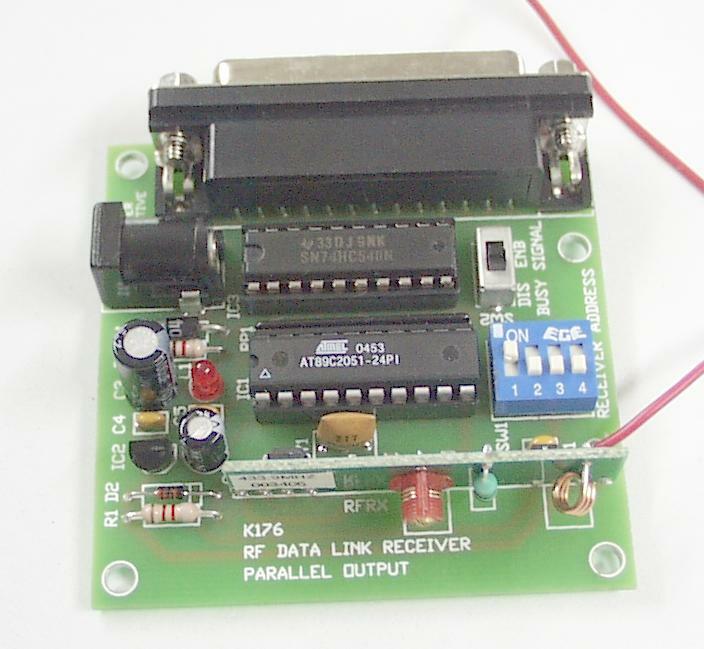 With the parallel RF data link, you can build a wireleass data controller with 100m range. 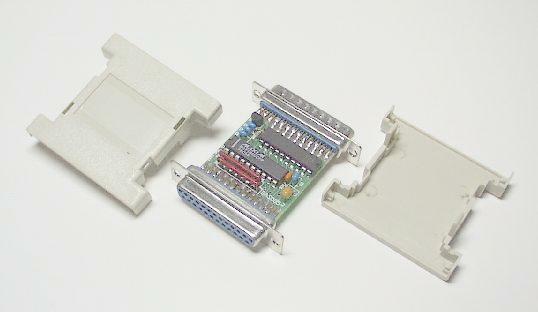 Use the parallel port of your PC as a real world interface. It enables your PC to both monitor & control external events and devices. The world is a mixed analog & digital world. With the appropriate sensors the PC can monitor physical variables such as pressure, temperature, light intensity, weight, switch state, movement, relays, etc, process the information and then use the result to control physical devices such as motors, sirens, other relays, servo motors (up to 11) & two stepper motors. 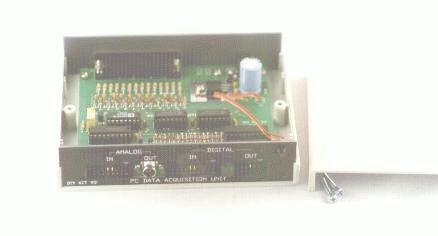 PC software and datasheet are included. With the parallel RF data link, you can build a wireleass data logger with 100m range. * Eight digital Outputs. Open collector, 500mA, 33V max. * Sixteen Digital Inputs. 20V max. Protection 1K in series, 5.1V zener to ground. * Small plastic box (140mm x 110mm x 35mm) with screen printed front & rear panels supplied. * Connected to the PC by a 25 pin straight through cable. * Software utilities & programming examples supplied.